After dinner tonight, which will be the next post, I was able to snap a few sky shots with my little digital camera (Lumix Lx3), I'll clean up more images and post them in a day or two but it isn't too shabby what can be snapped when you set and exposure for about a minute. I just had the camera on a small gorilla grip tripod resting on the roof my car. Below is a teaser. Hopefully I will be able to post a few more images in a few days. The little blob of red at the bottom of the picture is a tree and not some spectacular nebula. It is Winter here now but a few of the trees still have red and gold leaves hanging on. 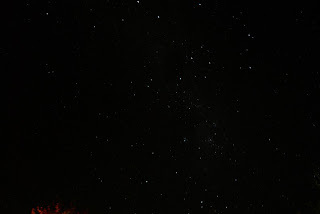 Being out in the bush away from Sydney gives you a whole new perspective on the sky. 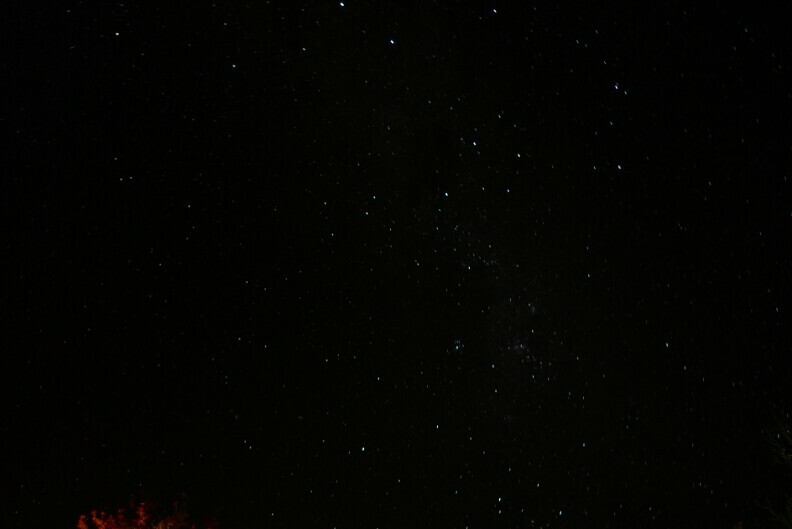 The Milky Way arches right across the sky from horizon to horizon. Arms branch out from the main body of stars which look like fog. The blackness of the Coal Sack stands out. It can't be seen in Sydney. I am almost certain I could make out the Large Magellenic Cloud with the naked eye here. It is a really faint cloud. It would be impossible to see in Sydney.